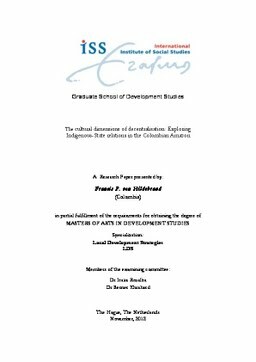 This study analyses the importance of cultural dimensions in decentralization processes focusing on the transformations in state/indigenous peoples’ relations and in indigenous collective citizenship since the 1990s in the Amazonas and Vaupés Departments of the Colombian Amazon. Three case studies related to Resguardo ancestral territories in the Pira-paraná, Mirití and lower Apaporis regions were selected for their geographical contiguity, cultural diversity and high rainforest biodiversity, and where Associations of Traditional Authorities conform Indigenous Local Governments. Analyses of coloniality/modernity, power relations and spaces of participation reveal bottom-up decentralisation processes and the effect on politico-cultural dynamics and contestation, territorial ordering, public education and local development.